CMAT Logical Reasoning Practice questions Set-6: This practice set has 10 questions with their answers and Explanatory answers covering topics from the areas of Logical Reasoning. CMAT Logical Reasoning Practice questions Set-6: This practice set has 10 questions with their answers and Explanatory answers covering topics from the areas of Logical Reasoning.This Practice set includes the Questions as per the CMAT Exam pattern and syllabus. A seminar for providing scholarship to school students is being organized by an Education Council. For the seminar, 7 teachers from different school have also been nominated (All these 7 attend the seminar is not necessary). Out of these A, B and C are teachers of mathematics and D, E, F and G are teachers of Science. At least 2 mathematics teachers should attend the seminar. B and D cannot attend the seminar together, C cannot attend the seminar with G and D and F cannot attend the seminar together. 1. If F is selected and B is rejected, then which four teachers will attend the conference? 2. If B is selected and F is rejected, then which of the following is a correct group of teachers attending the conference? 3. If C and D get selected, then which of the following two teachers will attend the conference? 4. If all the three mathematics teachers are selected, then how many combinations of four members can attend the conference? 5. 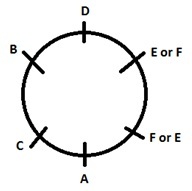 There are six people A, B, C, D, E and F in a round table facing the centre. Who is sitting opposite to C? I. C is to the immediate left of A.
II. A is opposite to D to whose immediate right is B. 6. Read the following information and answer the question. (i) A $ B means A is mother of B. (ii) A # B means A is father of B. (iii) A @ B means A is husband of B. (iv) A % B means A is daughter of B. A @ B $ C # D indicates what relationship A with D? a) Plastic money hinders the growth of the economy. b) Cashless economy is good for growth of a country in globalised scenario. c) Cashless economy is not good for growth of a country in globalised scenario. d) Cash intensive economy saves the printing and distribution cost of currency notes. 8. If Ramesh starts from point A and walks 5 miles, then turns left and walks 4 miles towards north, turns left again and walks 3 miles, in which direction is he now? 9. Statements: No stapler is page. Some staplers are books. I. Some book is page. II. Not all pages is book. III. No page is book. d) Only II and either I or III follow. 10. Statements: All discs are CDs. Some erasers are pens. All erasers are CDs. Some pens are CDs. I. Some pens are discs. II. Some CDs are erasers. III. All discs are erasers. IV. Some pens are not CDs. Explanation: 1) If B gets rejected, then A and C should be there. Also as F is selected D cannot be there and as C is selected G cannot be there. Explanation: 2) BD, CG, FD cannot be together hence options (a), (b) and (d) are eliminated. Explanation: 3) Since B and D, C and G, F and D cannot be together. Therefore, the correct answer is A and E.
Hence, both statements I and II together are not sufficient to answer the question. Explanation: 6) A @ B $ C # D means A is the husband of B and B is the mother of C and C is the father of D. so, clearly A is D’s paternal grandfather. It is necessary to remember that a move towards a cashless economy in boundary less world will eliminate the cost of printing and distributing cash. If to these expenses are added the cost of storage and maintaining the currencies in the over 60,000 ATMs, the outlay becomes prohibitive. The answer is a buoyant economy that will reduce the numbers of those who still regard cash as the only reliable legal tender.